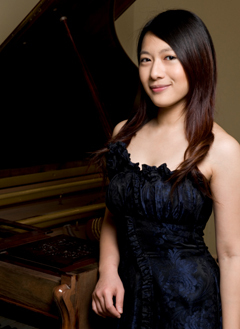 Pianist Cherry Tsang maintains a concert career as soloist, collaborator, and teacher. Since her 2009 debut at Carnegie Hall, Cherry has performed chamber music and solo works in Hong Kong, China, Thailand, Scotland, and throughout the United States. Recent collaborations include concerto performance with the Eastman School Symphony Orchestra, tours with the Eastman BroadBand ensemble in New York and Mexico, performances at the 2011 International Trumpet Guild and 2012 National Trumpet Competition collaborating with James Thompson, as well as performances at the Eastman Virtuosi Concert in March 2012. Cherry received her bachelors degree with honors from the Hong Kong Academy for Performing Arts, and her masters as well as the prestigious Performer's Certificate from the Eastman School of Music, where she recently completed her doctorate. Her principal teachers include Gabriel Kwok and Barry Snyder, for whom she has been teaching assistant from 2008 to 2011.